Killing bed bugs is never as simple as spraying something where you think they are and hoping for the best. Bed bugs have grown resistant to most common insecticides, and will likely continue to thrive in spite of your efforts. When dealing with a bed bug infestation, you need to apply a cocktail approach, employing the right combination of bed bug sprays and powders to make sure that the deed is done. Bed bug sprays and powders are found in two categories: contacts and residuals. A contact killer works exactly how you’d think – it kills bed bugs on contact. Sounds exactly what you’re in the market for, right? But before you go running off to the store with cash in hand, it’s important to know what to look for in a contact spray. Most common pest killers use a synthetic pyrethroid as their main active ingredient, such as cypermethrin, imiprothrin, or tetramethrin. While these chemicals have little to no toxic effects on humans, they act as a neurotoxin to many insect species. Pyrethroids can paralyze ants, roaches, wasps, and other creepy crawlies on contact, making them a very effective household pest controller. However, these solutions tend to have very poor results when used to get rid of bed bugs unless they are one of the newer formulas. Retail stores unfortunately sell older versions of pyrethroid sprays, which are no longer effective or used by professionals. Your best bet in a bed bug contact killer is a pair of natural compounds called pyrethrins. These chemicals are found in the seed cases of the pyrethrum plant, and have been proven to be effective insect neurotoxins. Pyrethrins work by interrupting the flow of sodium out of a bug’s nerve cells, causing the bug to die from the nerves firing signals too rapidly in response. Piperonyl butoxide is often included in pyrethrin mixtures, as it prevents the insect from detoxifying the pyrethrin. Okay, but What About Residuals? Pyrethrin sprays may kill bed bugs on contact, but they aren’t likely to be effective for more than 24 hours. Pyrethrins are biodegradable, and quickly lose their potency when exposed to light and oxygen. 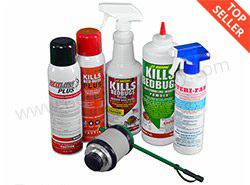 For long-lasting bed bug control, you’ll need residual compounds in your arsenal. Residuals are important as they work for up to 12 weeks offering a much longer killing ability than a contact killer. This is why you need to use both. Contacts kill quickly, but have very little residual past 24 hours. Residuals kill slower, but kill for up to 12 weeks. The most common residual route is with a spray, as they’re the easiest and fastest to apply. Pyrethroid-resistant strains of bed bugs are all too common to take your chances, so opt for a product with fenvalerate or imidacloprid. For best results, look for a spray that has both. These chemicals will kill bed bugs and their eggs for weeks after application, ensuring that an infestation won’t get a chance to repopulate after you douse them with a contact killer. It’s important to note that unlike pyrethrins, residual sprays can be harmful for people and pets, and should only be applied in cracks and crevices (areas that your skin won’t come in contact with). Be sure to always follow the product’s label and MSDS for safe and effective usage. Diatomaceous earth is growing in popularity recently as a residual powder solution, used in combination with a residual spray or on its own. Diatomaceous earth is a fine white natural powder made from fossilized diatoms, a major group of algae that have existed for over 180 million years. Residual powders work by clinging to the bed bugs’ waxy exoskeleton, absorbing the nutrient-rich lipids on their shells and causing them to dehydrate. The beautiful thing about using diatomaceous earth is that it works indefinitely as long as it stays dry; if exposed to water, it loses the abrasive quality that makes it an effective bed bug killer. The simple answer is that you should be using all three (contacts, residuals and powders). Apply a contact spray where bed bugs might be hiding: spray along baseboards, below drawers and on drawer slides, behind cabinets, and behind night stands. Immediately after the contact spray has been applied, a residual should then be used on the same areas as the contact, offering long lasting protection against returning bed bugs. Once the bed bug sprays have been applied and completely dry, it’s time to put down the bed bug powder. This should be applied into confined areas where it will not be stirred up into the air. Examples include below the edges of carpeting, inside deep cracks and wall voids as well as inside electrical outlets and switch plates by first removing the faceplate with a flat head screwdriver (never apply powder where electronics are plugged in and always turn the power off first to reduce the risk of electrocution). We recommend using a dust mask and a professional applicator. This cocktail solution is sure to cut down on the population of bed bugs in your home, slowing their reproduction and killing them off over time through residual solutions. Using bed bug sprays and powders in conjunction with insect traps and mattress covers makes for a potent integrated pest management approach.